Material is central to Lara Almarcegui’s work. She explores sites in transformation: quarries, construction sites and wastelands where the materials themselves become the object of a tension between destruction and renewal. 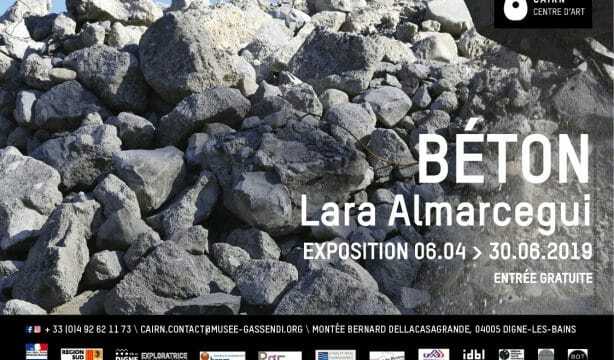 At the CAIRN art centre, Lara Almarcegui’s project reoccupies the recent construction site of the Bléone river which passes through the town of Digne-les-Bains. This construction work aims to rectify the dam works carried out in the 1970s, in order to restore the biological continuity of the river and the transit of sediment. 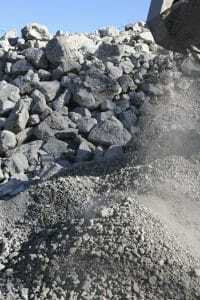 During construction, the concrete weirs – made with cement, gravel and sand – were taken out of the river and crushed. The artist recovered this raw material, which now covers almost the entire surface of the exhibition room. This is a peremptory gesture that puts the visitor in the presence of a material from the mountains, handled and used by man in the construction of a dam, then demolished and reused successively for other construction projects. Through the striking presence of raw material, Lara Almarcegui engages in a reflection on urban development by making debris not a poetic element, but rather a political one. The second part of her project is being developed in collaboration with geologists, who assist her in the ambitious calculation of the weights of the various rocks over the entire Bléone catchment area. Presented in the form of a list, these calculation figures are the ingredients which, in an extremely concise manner, evoke the elements that make up the valley as well as the history of the mountains. Without nostalgia or fascination for the past, Lara Almarcegui reveals a transitional stage among the different phases of material transformations that succeed one another in time. Revealing the layers of an underground memory, the project realized in Digne-les-Bains is a reflection on the geological past of this area, but it also questions the future of the material of which it is composed. A publication will accompany the exhibition, with texts by the art historian Natacha Pugnet and the Latitudes collective (Max Andrews & Mariana Cánepa Luna,) published by Silvana. Lara Almarcegui lives and works in Rotterdam, in the Netherlands. Her work is both a material and immediate presence in the exhibition room and an invitation to go out into the field, to physically explore new areas of understanding. Through her work, she questions the ideas of ownership, urbanization, transformation and control of the area. On the other hand, she attempts to decipher the numerous links that exist between architecture and urbanism, and between material and its different forms of use. Lara Almarcegui represented Spain at the 55th Venice Biennale in 2013 and the Biennale de Lyon in 2017. Talk by Lara Almarcegui in the auditorium of the IDBL art school in Digne-les-Bains. Walk with commentary by a cultural mediator of the CAIRN art centre and a geologist of the UNESCO Géoparc de Haute-Provence. Interpretation of the landscape and presentation of the artist’s approach. Departure from Digne’s large bridge, to reach the CAIRN art centre via the Caguerenard path (duration: 2 hours). Free of charge. Advance booking is required. * Guided tours are available for parties by advance booking.